Bandai Namco’s Tales of Vesperia was originally released in 2008 as an Xbox 360 exclusive; however, in 2009, the game was ported to Sony’s PlayStation 3 with new content limited to Japan. To celebrate the title’s 10th anniversary, the publisher is gifting Tales fans with the release of Tales of Vesperia: Definitive Edition. Widely considered to be one of the best ‘Tales of’ games in existence, this offers all the charm of the Xbox 360 version and now features the new content previously restricted to the Japanese version of the release. Whether this is your first time playing through Tales of Vesperia or a return visit, the game is a captivating, polished, and delightful adventure that will keep you engaged from start to finish. Thanks to its eccentric cast of likable characters, vast world, compelling narrative, and fast-paced real-time combat system, there is a lot to love with Tales of Vesperia: Definitive Edition. Though some areas show their age, the overall package has aged like fine wine. Despite being designed as a home console RPG, the game is well-suited for portable play and feels right at home on the Nintendo Switch. What makes Tales of Vesperia such a delight is the lighthearted aura the resonates from the main characters. Even during moments of tribulation, members of your party keep an upbeat attitude. This pleasant demeanor is contagious & can directly reach & touch the player through the well-composed voice acting & the optional conversation skits the characters sporadically participate in. These skits help to expand upon the game’s narrative and aid the player to better connect with the characters. You will form a bond & understand each character, their motivations (or lack thereof), and feel connected to each member of your party. This is an achievement that very few RPGs can accomplish. The world of Tales of Vesperia is expansive, with many optional quests, hidden treasures, and elaborate labyrinths to explore. Many of the elective missions offer the player with a reward of new weapons, financial growth, or promise to see new regions of the world. Whether you focus primarily on the main quests or branch out to the side content, you’ll always feel like you’re making progress and not wasting time. There is a lot to see and to do within the world of Vesperia, and players should take the opportunity to explore and enjoy the adventure for all that is has to offer. As you explore the world’s setting, the more you feel connected to it. At first, you may not care much about the story or the events unfolding. You’ll feel like the main character, Yuri Lowell, and just want to get the mission done. After a few hours, though, you’ll form a connection to the characters, the story, and even be able to see and appreciate the beauty of the towns and the environments, just as the characters do. New to the Definitive Edition, at least here in the western market, is the inclusion of Flynn and Patty as playable characters, new story scenarios and skits, optional dungeons, and more. The new content feels natural to the main game and not like a secondary addition. Due to the new content, there are extra lines of spoken dialogue that aren’t recorded by the original cast – especially in Yuri’s case. Though the replacement does their best to mimic the original voice actor, there is a clear tone difference and it can be slightly distracting. 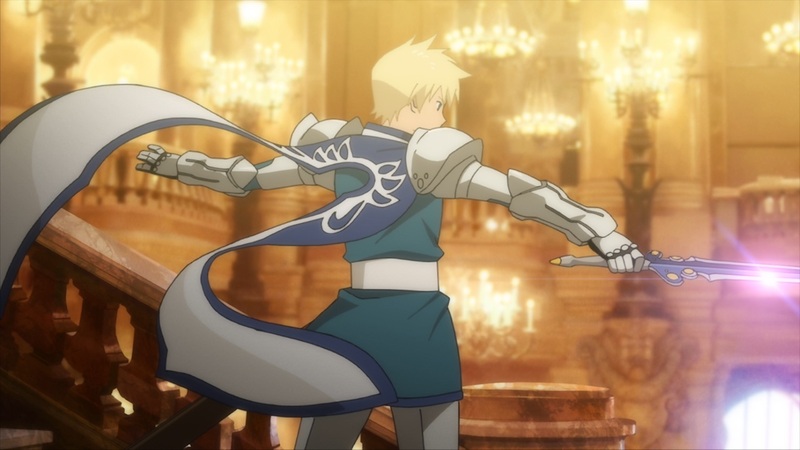 Vesperia’s narrative is more than capable of keeping you enthralled for the duration of the game, but the game’s combat system adds an extra layer of joy to the overall experience. The combat is fast and focuses on action – though you will need to practice some form of strategy and tactics during select encounters. Combat grants the player full control of one party member, yet the option to swap between control of party members is an available option. While you control your character of choice, the remaining members are controlled by the A.I., which will make battle decisions based on the tactics you assign them. For example; you assign Estelle to keep her distance from foes and focus on healing party members; meanwhile, Rita is assigned to use powerful magic Artes to disrupt the enemy. Despite assigning tactics to each party member, the A.I. doesn’t always follow them perfectly and you may find a character being inactive during combat. Nevertheless, the A.I. will attempt to closely follow whichever tactical approach you set for them and it is best to experiment with multiple solutions before settling on one. Once you form a workable battle strategy, you’ll find that standard battle will conclude just a few seconds; meanwhile, boss battles may go on for several minutes. Once you become more attune with assigning strategies to your party members and understand the speed of combat, you’ll be able to perform elaborate combinations that keep enemies off-balance, trap them in attack loops and quickly finish them off. It is an easy to grasp combat system, but has a lot of depth for those willing to dive in. If you find bosses or standard enemies to be too difficult, the game does provide players with some aid. By visiting the eShop, you will find a couple of free DLC packs that contain level boosters and a lot of money. The level boosters instantly raise the level of your party, unlock new skills, and allows the player to enjoy the story without concern about being too weak to defeat foes. The extra money will give you the option to stock up on healing items or high-end weapons and equipment.